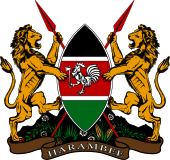 The President of the Republic of Kenya (Swahili: Rais wa Jamhuri ya Kenya) is the head of state and head of government of Kenya. The president leads the executive branch of the Government of Kenya and is the commander-in-chief of the Kenya Defence Forces. The official residence of the president is at State House, Nairobi. The wife of the President is referred to as the First Lady of Kenya. At least twenty-five per cent of the votes cast in each of more than half of the counties. Presidential Standard of Jomo Kenyatta. Presidential Standard of Daniel Arap Moi. Presidential Standard of Mwai Kibaki. Presidential Standard of Uhuru Kenyatta, the current President. ^ Nsehe, Mfonobong (2014-03-09). 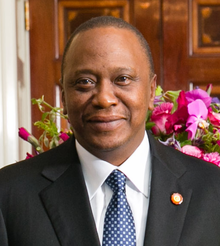 "Kenya's Wealthy President Uhuru Kenyatta To Take Pay Cut". Forbes. Retrieved 18 December 2014. ^ "138. Procedure at presidential election - Kenya Law Reform Commission (KLRC)". www.klrc.go.ke. Retrieved 2017-11-02.